"Not separate, but still unequal"
Last week, Terry Teachout penned a Wall Street Journal essay addressing the lack of parity for female playwrights in American theater. The column was partly inspired by statements from playwrights Paula Vogel and Lynn Nottage, who decried an uneven playing field for women writers. Vogel and Nottage are case studies of the obstacles women face: both are Pulitzer Prize winners decades into fruitful careers, and both made their Broadway debuts only this year. After reading the column, I thought about parity in my own backyard. Many of Philly’s finest resident actors, directors, and playwrights are female or gender-nonconforming, nonwhite, and openly LGBTQ+. More than a half-dozen women run theater companies in the region, and Theatre Philadelphia recently named Leigh Goldenberg its first executive director. Jacqueline Goldfinger keeps winning playwriting prizes, Mary Tuomanen produced three new works in 2017 (and counting! ), and what isn’t multi-hyphenate extraordinaire Kittson O’Neill doing? But numbers don’t lie. The works produced by Philadelphia’s major theaters during the 2016-2017 season skew male and white. None of Walnut Street Theatre’s 10 shows were written by women — unless you count A Child’s Christmas in Wales, which Charlotte Moore conceived from Dylan Thomas’s extant writings. Arden Theatre Company and Philadelphia Theatre Company each offered one woman-authored play. Wilma Theater and Lantern Theatre Company both produced one play written by a female playwright and one co-authored play. I thought perhaps mid-sized companies — which tend to attract younger audiences and cater to fewer older donors — might be in a better position to foster diversity. But like their more established counterparts, Azuka Theatre, Theatre Exile, Theatre Horizon, and Curio Theatre Company all produced one female playwright in 2016-2017. The New YorkTimes's Laura Collins-Hughes labeled this laziness "theatrical manspreading," and she knows a thing or two about how it works. ...​The greatest commitment to equity comes from small companies and collectives, such as the “women-centric” ReVamp Collective and the writer-focused Orbiter 3. 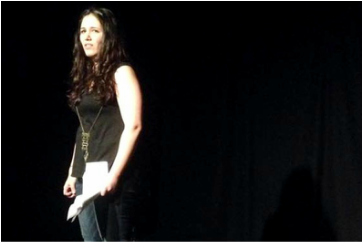 Carly Bodnar and Erin Carr founded ReVamp in 2014 to “create a space for women to create.” Their programming agenda has included short plays, staged readings, and full productions representing a diverse slate of emerging female and feminist voices. By the time Orbiter 3 disbands early next year, four of its seven plays will have been written by women. Conversations surrounding gender parity in theater must also include discussions of race. The overwhelming majority of women-authored plays presented in Philadelphia last season were by white authors. Among the major and mid-sized theaters in Philadelphia and the surrounding suburbs, I count four productions of plays written by women of color: Tracey Scott Wilson’s Buzzer, at Theatre Exile; Mia Chung’s You For Me For You, at InterAct; Katori Hall’s The Mountaintop, at People’s Light; and Pulley & Buttonhole’s One More River to Cross: A Verbatim Fugue, by Lynn Nottage. That’s simply not enough. There are several ways Philly’s larger companies can foster and improve their commitment to representational equity. Artistic administration could hire theater makers like Bodnar, Carr, Orbiter 3’s Maura Krause, and Women’s Theatre Festival founder Polly Edelstein as consultants. These artists have proven track records getting female voices on stage. Companies lacking in representative programming can also learn from larger theaters, like People’s Light and Pig Iron, that regularly deliver diverse seasons. Recently, playwright Ifeyinwa Frederick floated a yearlong moratorium on Shakespeare. “There are playwrights out there writing stories with casts that reflect the world we live in today,” she wrote. “If the industry could stop indulging in Shakespeare for a year, we could give these voices a chance.” Sign me up — and add Tennessee Williams, Eugene O’Neill, and David Mamet to the list. Check out Parity Productions and the Kilroys instead. Theater has the potential to hold a mirror to society — but how honest can the reflection be if half the population accounts for only 20 percent of stories told? If women writers of all backgrounds cannot attain equal footing, does theater just passively reinforce the status quo? I find myself coming back to a sentiment espoused by ReVamp’s mission statement: “Art is created to give a voice to those without a platform. And until diversity is mainstream — including gender, race, sexuality — there is still art to create and stories to express.” Women writers create art encompassing a vibrant array of experiences and worldviews. Doesn’t that pair neatly with the goals of stages of all sizes throughout our city? A Temple alumna’s theater company aims to challenge the role of women. Those experiences were only one of the sparks that ignited the creation of ReVamp Collective—a woman-centric theater troupe. ​Founded in 2014 by Bodnar, a 2007 alumna, and Erin Carr, a graduate of New York University’s Tisch School of the Arts, the Philadelphia-based company works toward gender equality in theater. From debunking stereotypical female characters to providing opportunities to write plays, the company cultivates opportunities for women in all realms of theater. Though creating a space for women is an integral part of ReVamp, ultimately, the company’s mission is fueled by inclusiveness. ReVamp Collective came to be when Bodnar met Carr at Theatre Horizon in Norristown while teaching drama to elementary and middle school students. The piece explored women’s perceptions of male communication toward them, like catcalling. Carr said the production was a reminder to keep the company inclusive of both genders. By having men in the piece, this examination could be contemplated from both sides of the confrontation. For its upcoming season, ReVamp is being “revamped,” Bodnar said. Bodnar’s currently choosing which new plays, written by local artists, to feature as readings in female-owned establishments, like restaurants and hair salons. One reading will be performed in the fall and another in the winter, before putting on a new fully-produced play in the spring. This greater movement will exceed the theater’s four walls, creating conversations in local businesses and education programs, which Bodnar and Carr hope to create in the near future. The company plans to teach theater classes in schools throughout the Philadelphia area not only about acting, but the troupe’s feminist principles that call for constant evolution.